The Durham Building of University College was erected in 1902, and the architect was Harry Wilkinson Moore. It is named after William of Durham, who endowed the college in 1249. It is a Grade II listed building (List Entry No. 1299972). It was the last building in the High in St Peter-in-the East parish until that parish was united with St Cross parish in 1957. The Durham Building replaced the earlier University Hall which was given to University College in 1763 but had become very decrepit (see picture on English Heritage site). The college appears to have let out the old buildings on this site. 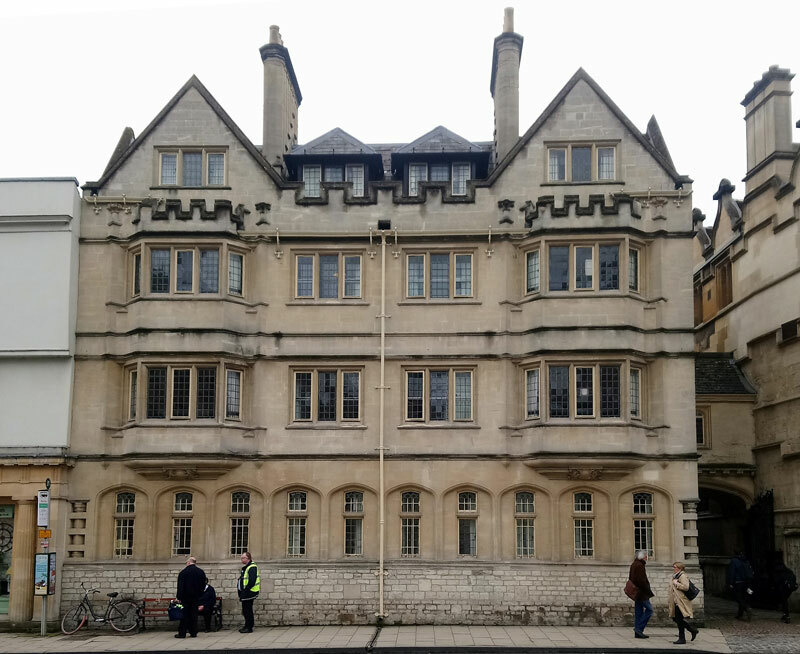 At the time of the 1772 Survey of Oxford, there were two dwellings here: the one on the site of No. 88 to the left was occupied by Mr Kemp, and had a frontage of 10 yds 2 ft 9 in; and the one on the site of No. 89 on the right was occupied by Mr Parker and had a frontage of 5 yards 1 ft 3 in. in 1861 the former No. 88 was occupied by William Cattle (aged 77) and his wife, lodger, and three servants; and No. 89 was occupied by a French milliner and dressmaker, Mlle Florentine Duprez, and her apprentices and servants and undergraduate lodger. Halford’s Livery Stables appear to have operated from Tarry’s Court behind. It is not until 1869 that directories start to list Nos. 88 and 89 as being part of University College. In the 1871 census the old building is described as University Hall, and was occupied by William Tomlins, the college porter, and his wife and children. At the time of the 1881 census, No. 88 was uninhabited, and No. 89 was occupied by the college porter, John Wheeler, with his wife and two children. He is described as the head of the household, and living with him as “boarders” was the following disparate trio from University College: an undergraduate, a second college porter, and the lecturer in classics. In 1904, despite opposition from the city council, a bridge was built across Logic Lane linking this section to the main body of the college to the west.